Here’s another long entry from a day with few miles. So yesterday ended with a bit of a cliff hanger. We did not make our goal mileage due to rain on and off all day that slowed us and then swelled the Tapeats Creek where we decided to stop short because I wasn’t comfortable with how swift it was. The hope was that it might go down overnight, but we went to bed to rain and then even more rain (and lightning) around 2am. Not good…we went back to the Tapeats this morning after a 6:45am start and we couldn’t tell if it was any shallower. We both felt like it seemed deeper, but less forceful somehow. We noticed that it was shallower along the sides and much less swift, so I was willing to give it a shot. My theory was that if I did fall in, it was shallow and narrow enough that I wouldn’t be completely swept away and would be ok. That did make it less intimidating when I thought of it that way. It ended up being an ok experience and not as frightening as I’d imagined. I’m 5’3″ and the water tended to be knee to mid thigh high. It was swift, but the sides were shallower. There were some brief times when we’d walk downstream with the current, but other times we’d cross to do a dry stretch on land. There were many stints of trails along the sides and that was a big relief. I also liked that the Tapeats was pretty narrow, so crossings were done quicker. If there was a deeper part or section with a swift current, Gavin stood upstream of me to break the force some. I don’t know how much of a difference it made, but it at least helped me mentally to think it was taking the force out of the current. After about an hour or so, we reached the final crossing where Thunder River joins Tapeats Creek. 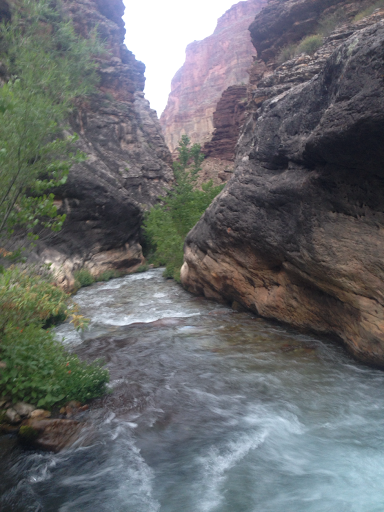 Thunder River crashed down into the Tapeats in a beautiful yet intimidating way. This was where the final and most warned about crossing was. This picture doesn’t do it justice, but I agree with naming it Thunder River. It was powerful. After we got to the top, we got to cruise a couple miles through the flat and smooth Surprise Valley. It was great to just stretch our legs. While we were going through there, we saw fresh Cascadia prints, which meant that either the brothers or Katherine could be just ahead of us, but neither made sense since we thought both had schedules a day or two off from ours. 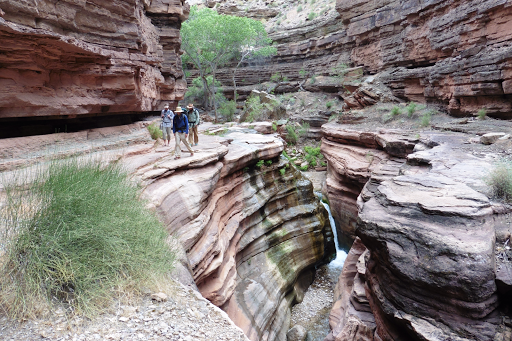 At the end of Surprise Valley, the trail drops down to the popular campsites of Deer Creek, which continues down to the Colorado River. 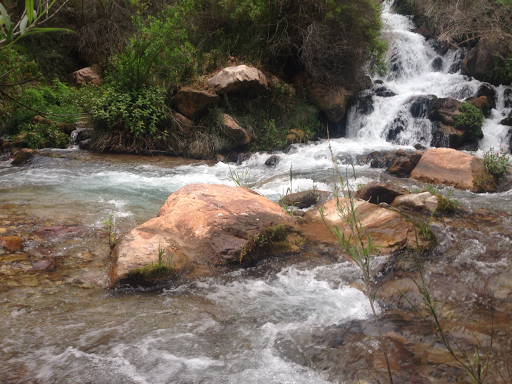 Halfway down to Deer Creek, I came to the intersection that led to the upper Deer Creek Falls. I paused and heard someone yell my name. When I looked over to the falls, it was the brothers Evan and Chase! 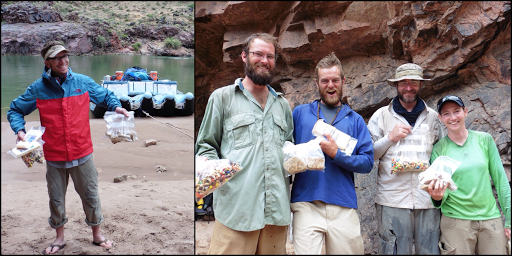 We last saw them 10 days ago (Day 44) lounging at the Little Colorado after we got our first hitch across the river. It’s always fun to see them and have them be part of this hiking bubble. Since we did an alternate and they stuck to the original route, we knew there might be another opportunity to overlap. 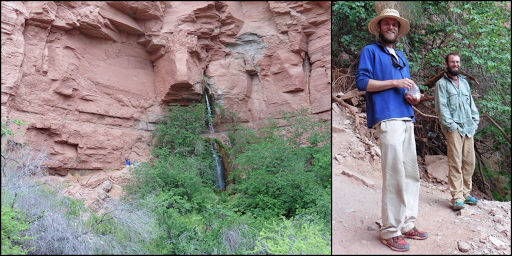 We chatted a bit, but we were trying to make up for lost miles yesterday and hiked on down to Deer Creek. 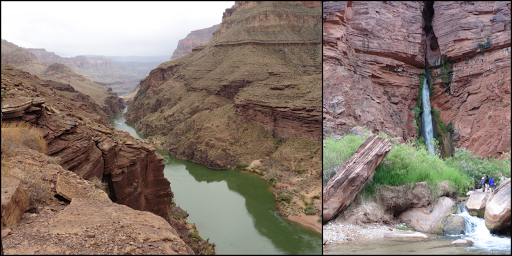 As we got closer to the Colorado River, we saw groups of rafters hiking up from the river to get a day hike in. The clouds still hadn’t lifted from yesterday and the drizzle that had started became a full on rain, so we stopped under a shelf and had lunch a bit early to wait it out. We got to chat with lots of people. 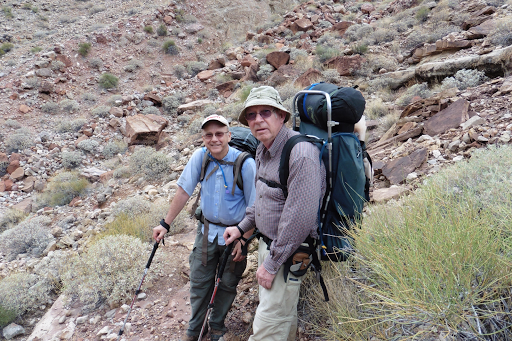 Two of them, Jerry and Norm, were two older guys backpacking the same difficult route we were about to do over the next few days. They were great! They keep a blog that I think is titled 7 Days, 6 Nights with blogspot. 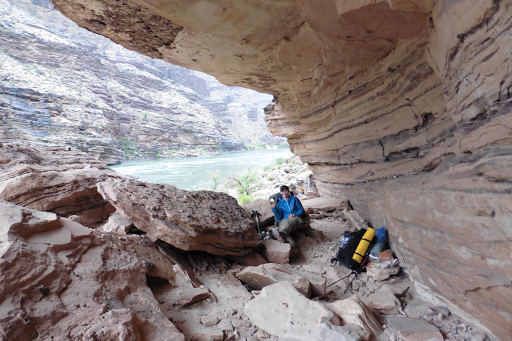 We couldn’t believe people other than Haydukers would voluntarily do the rocks and boulders along the Colorado River for 7mi from Deer Cr to Kanab Cr. Jerry and Norm said it was actually their fourth time doing this trip and that twice they bailed on the rock hopping and hitched a ride with a raft, and the other time, they had to bail because one of them sprained an ankle on the rocks…my fear! As we finished lunch, the rain tapered off and another rafting group came up. One of the guides named Ben said hi and knew about the Hayduke because just a couple days ago, his current group gave a hitch to Busted Magic and Wade across the Little Colorado. He said they were very low on food and that he had helped them out. Then he told us that if we were hiking down to the river, he had extra food to give us. We definitely perked up to that! About this time, Evan and Chase arrived and we all hiked down. This hike up from the river is one of the highlights of the rafting groups and I understand why. Great spot! As we hiked down the short bit, it really started to rain hard. Not okay for our scheduled boulder hopping. There were great views of the river and a waterfall at the bottom. We took shelter under a dry overhang with Evan, Chase, and some of the raft passengers. Ben came down and brought us lots of great food! He gave the four of us trail mix, bananas, apples, tortillas, a loaf of bread, lots of sliced cheese, and two cooked and seasoned pork chops each from their breakfast. 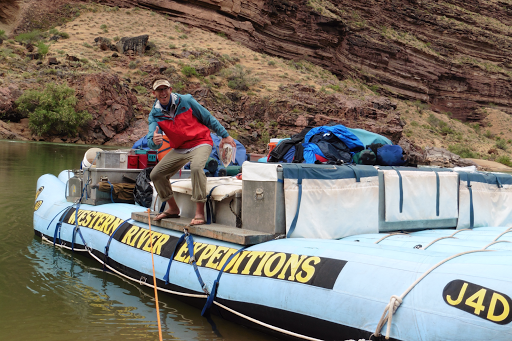 Thanks to Ben and Western River Expeditions! All of us were sooo happy. As it rained, we all ate most of it. It was heavenly! Hiker hunger seems to have set in this week and I’ve actually had to be careful about not eating all my food. Now that we are behind schedule due to the rain yesterday, and now also today, I had been rationing food in preparation for adding another day to this leg. The food Ben gave us helped ease that worry and the need to push through rain on boulders today. We hung out for maybe two hours as it rained on and off. This pretty much sealed the deal that we were going to have to add a half day to this leg and now we have the food to do that comfortably. Gavin and I still needed to get some miles in, so we headed out to start the rock hop. The rain continued on and off all day coming down as sprinkles at times and then turning into a steady shower at others. We had a bit of time on the rocks and then there was a high “trail” to bypass the rocks for almost two miles. The map says to head up the loose talus at the cairns, but we didn’t see the cairns, so we headed up where the waypoint was on the GPS…not a great idea apparently. It was ridiculous. We took the better part of an hour precariously hiking up steep loose talus as it rained on and off. 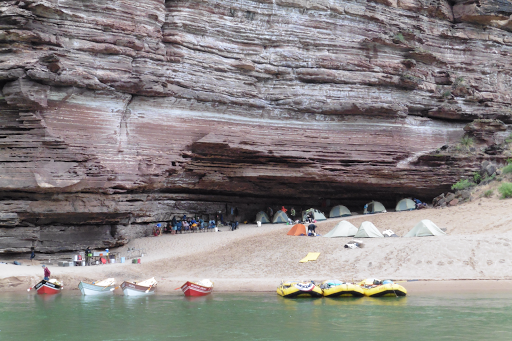 On the other side of the river were large guided boat groups that had set up camp. We gave them some entertainment I’m sure. Here’s one of the nice camp setups and a shot of Gavin going up the talus. I couldn’t zoom out with how close I was, but it was quite a climb. 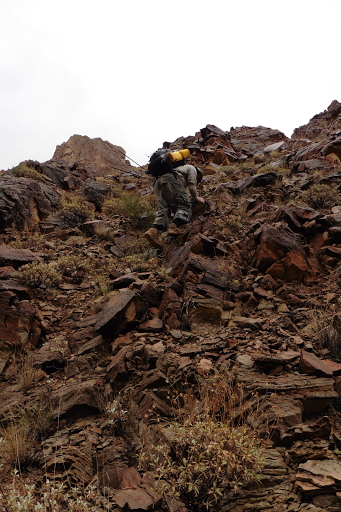 When we finally got up top, there was a faint trail and it kept being washed out and we’d have to cross gullies on steep angles with loose sandy debris and more talus. All this was intended to get us up over the time consuming rock hop for a mile or two and I think it was worse. While up there, Evan and Chase arrived and were within shouting distance for awhile. After more sketchy traversing, we got to an area where cairns led up to a real game trail that was smooth sailing. We caught up to Jerry and Norm who are amazing to a) do this voluntarily, trying for the fourth time b) sticking it out in the rain. They were hiking that whole time while we had hung out I a dry spot with the boaters earlier. Jerry and Norm confirmed that we had gone up way too early and we should have waited til we saw the cairns, doih! Here’s Jerry and Norm. Great to meet them! Right as we finished the high traverse, the rain came down hard again and we ducked into a great overhang. The most difficult part of the boulder section was still ahead and we needed 5hrs to do those 5mi. It was already 5pm, so it wasn’t happening. We decided to do the short .6mi to the only campable area in that stretch and call it a day. We waited out the rain about an hour and I enjoyed my apple from earlier. Oh the luxury! We wondered where the brothers went to since we figured they’d end up with the same plan and we’re going to call them over to our sheltered spot out of the rain, but we never saw them. The rain mostly stopped and we decided to make a run for it seeing that it was not gone for good. As soon as we stepped out of our nice sheltered spot, the brothers appeared. They were in the rock overhang right next to us that whole time and neither of us knew it. Great minds think alike, ha! 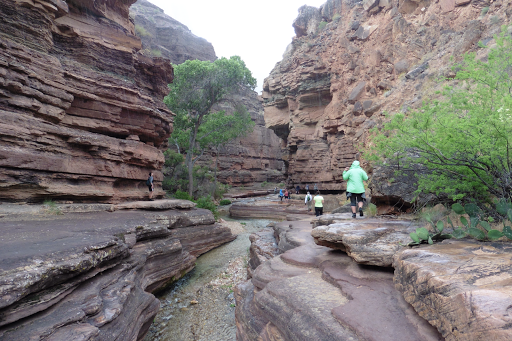 We all hiked the short stretch of biukders to Fishtail Canyon, and it started to rain when we arrived. 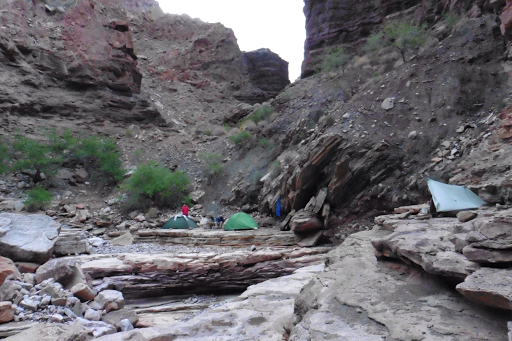 To avoid wet sand camping on the beach, we went back a bit into the actual canyon and setup tents on some of the shelves. Great spots! There were even spots to sit out of the rain, so we did that and hung out a bit until the rain stopped and then setup. It was later than I would have liked, but it was fun to have that communal thru hiking experience of a day like today with other Haydukers that also enjoyed the company. Evan and Chase said they hadn’t camped with anyone else all trip. I do think I’ve been fortunate to have this bubble of Haydukers to give this hike a more communal feel like the other trails. I really did enjoy today despite the rain and few miles. 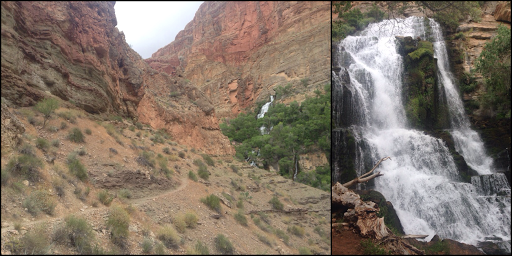 Today had some of the most quintessential experiences of both thru hiking and hiking in the Grand Canyon. 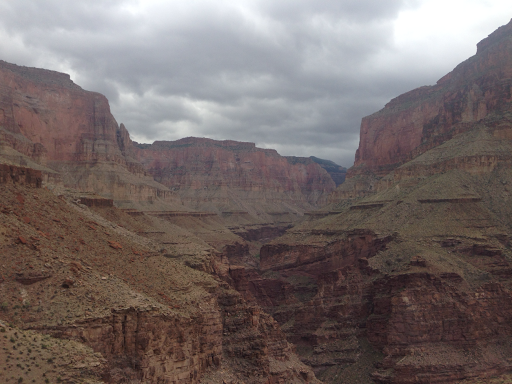 Really, one of the more memorable days…tomorrow, we HIKE!